Formed in 1981 by Linda Davis, Davis Quality Engineering operated out of a small rental unit in Santa Fe Springs, California. Two years later a partnership was formed and the company name was changed to Futura Engineering Laboratories. By the summer of 1985 the partnership had dissolved and ownership reverted back to Linda & Jim Davis who subsequently incorporated the company under the name of Davis Quality Engineering, Inc. The company continued to grow, and in March of 1987 a new building was purchased at the present location in Brea, California. This new eight thousand square foot facility enabled the company to expand its in-lab services to the current level while accommodating the vehicles and equipment needed for the rapidly growing field service. 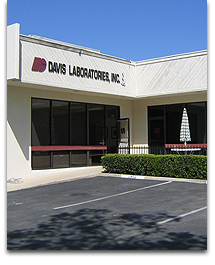 In July of 1995 an existing laboratory in Las Vegas, Nevada was purchased and re-named Davis Laboratories, Inc. Shortly thereafter a decision was made to change the name of the Brea, California facility to Davis Laboratories, Inc. In May of 2006 office space was leased to enable Davis Laboratories to expand into San Francisco due to repeated requests from potential customers and current clients with branch offices in the bay area. Davis Laboratories, Inc. continues to grow while maintaining its commitment to provide quality service throughout California, Nevada and parts of Utah and Arizona.